Two years ago a couple of friends got together to share a beer and an idea. They discussed the merger of their two passions and professions: Beer and Comedy. Laura Decker of Renegade Brewing and Kayvan Khalatbari of Sexpot Comedy decided to take a chance on this idea. And so the first craft beer comedy show, Offensively Delicious, was born. This is not the typical beer event. 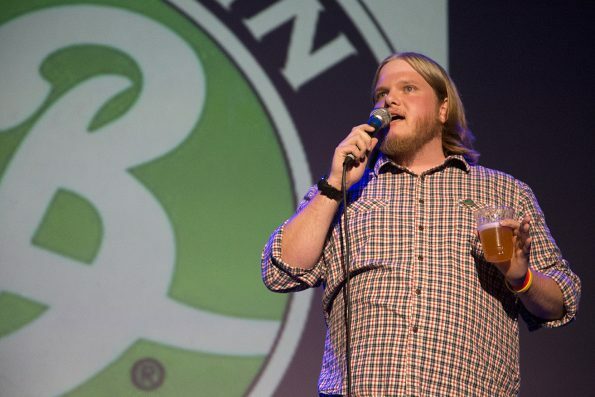 Ten breweries are invited to participate in two ways: provide beer and provide comedy. From 6-8 guests enjoy unlimited samples from the brewers. At 8 PM as the show starts with “Open Mic” comedy featuring the brewers as comedians. There is no telling what will happen when you give a brewer a microphone, but the result is a room roaring with laughter. After brewery-provided comedy, the real comedians step on stage. The last two years featured nationally known comics such as Kyle Kinane and Nikki Glaser. After selling out the Oriental Theater in 2015, the Renegade/Sexpot crew secured a larger venue closer to downtown: The McNichols Civic Center Building. Participating breweries include Alpine Dog, Brooklyn Brewery, Fort Collins Brewery, Great Divide, Lakefront Brewery, Liquid Mechanics, New Holland, Renegade, Shmaltz, and Spangalang. The breweries will be joined by two national comedians in 2016: Beth Stelling and Matt Braunger. Beth works out of Los Angeles and has recently received accolades such as “Comic to Watch in 2016”, “The 10 Best Stand-Up Specials of 2015”, and “Top 18 Women You Should Be Following On Twitter”. Matt Braunger has a laundry list of national appearances including NBC’s UP ALL NIGHT, a series regular role on MADtv, and various roles on The Tonight Show with Conan O’Brien, The Late Show with David Letterman, United States of Tara, Pushing Daisies, Carpoolers, The Late Late Show with Craig Ferguson, Acceptable TV, and Live At Gotham. The larger space will also allow new ticket tiers including a VIP section sponsored by ViewHouse Restaurants. Preferred Seating and General Admission tickets are available as well. The profits for October 5th’s event will be donated to the Colorado Coalition Against Domestic Violence. October is Domestic Violence Awareness Month, the funds will be used to support victims and end domestic violence in this state. Tickets are available now through local ticketing company, Two Parts.